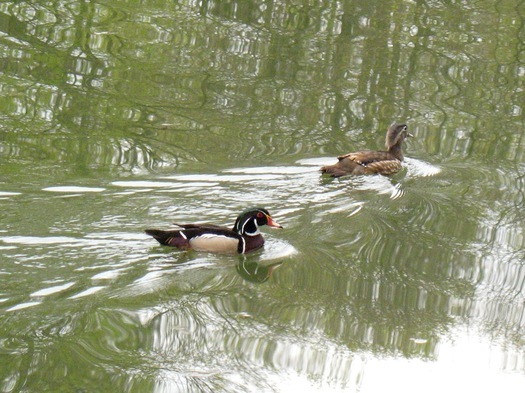 Wood ducks spotted in the Washington Park lake last year. Bird watchers and nature fans of all kinds can try their hand at spotting the many species of birds in Washington Park. Tristan Lowery and John Pipkin from the Washington Park Conservancy will lead the walk and share their birding expertise. The program will begin at Englewood Place in Washington Park. Participants should dress for all weather conditions and are encouraged to bring binoculars. The walk starts at 8 am. Suggested donation is $10. You might think spotting a bunch of different types of birds right in the middle of the city would be hard, but as Julie noted last year, there's a wide range of feathered creatures who make a stop in the park. The date has been corrected (the day was correct). Sorry about that. Has there been any word on whether the Wood Ducks have returned? whenever it is, sounds great! The Wood Ducks are back. I've seen them a couple of times since early April. I saw a pair of wood ducks there last week. Not sure if they were staying or passing through. Date fixed. Thank you for the heads up.